Established in 1860, the U.S. Department of Agriculture has grown without cease and is now the most entrenched of all federal agencies. The Farm Bills signed by Presidents Bill Clinton in 1996 and George W. Bush in 2002 only served to further expand this byzantine system. Economists are nearly unanimous in their denunciation of this wasteful and pernicious web of politics. Subsidies for not growing crops are so notorious that they have been the object of biting political satire since their introduction in the 1930s. However, few books have critically analyzed government farm programs in their entirety. Plowshares & Pork Barrels provides the historical and economic context necessary to make sense of U.S. agricultural policy and examines possible market-based alternatives that could benefit consumers and ensure the advancement of American agriculture in an increasingly interdependent global economy. U.S. agricultural programs, with average annual outlays typically in excess of $20,000 per farm since the mid-1980s, are costly relics of the New Deal. Despite remarkable transformations in economic conditions in U.S. agriculture since the 1930s, extensive government involvement continues. Farm programs are schizophrenic in their impacts. Billions of dollars are spent annually on agricultural credit programs and research and extension programs that reduce commodity prices. At the same time, billions are spent on commodity programs that increase prices received by farmers. Price supports and other farm programs do not increase farmings long-run profitability. Instead, they increase production costs as the value of government benefits is incorporated into higher prices for land and other specialized inputs. The largest 17% of U.S. farms receive almost three-quarters of all government farm payments. From 1995 through 2003, Riceland Foods, Inc. (a farmer-owned cooperative headquartered in Stuttgart, Arkansas) received almost $520 million in USDA subsidies. Overall, the average household income of farm operators has typically exceeded the average income of all U.S. households over the last two decades. Farm programs are designed to benefit special interests, not the public at large. In addition to individual producers of various commodities and some large agribusiness firms, government employees also gain. The number of USDA employees has increased more than fourfold since 1929, even as the number of farms has fallen to one-third its level at that time. U.S. farmers have not become less dependent on government farm programs in the past decade. Although many fundamental changes were made in the 1996 farm bill, government spending reached near-historic highs during the late 1990s. Moreover, the 2002 farm bill reversed many of the 1996 changes and increased the level of funding for many farm programs. In 2004, the total value of export subsidies for farm products, including credit guarantees, was about $5 billion. These subsidies are inconsistent with the WTO objective of liberalizing foreign trade. U.S. and European agricultural policies remain a perennial obstacle to WTO attempts to reduce trade barriers. Phasing out its farm programs is essential if the United States is to use its resources most effectively, even if current WTO negotiations fail to reduce barriers worldwide. The United States Department of Agriculture was created in 1862 as an information agency for farmers. Its establishment laid the foundation for widespread government intervention in agriculture. Until the 1930s, however, government played a limited role in agricultural markets, primarily one of emphasizing ways to increase the productivity of crop and livestock producers. This changed dramatically in the 1930s under the Roosevelt New Deal, with the enactment of a multitude of farm programs to regulate the production and marketing of agricultural products. Agricultural subsidies have expanded ever since, and farmers have remained among the countrys most effective special-interest groups. In the 1980s, the Reagan Revolution (despite the deregulation rhetoric) made not one dent in Americas farm and food programs. Some industry observers and participants thought the 1996 farm bill would initiate a new era of reduced government involvement, but the farm lobby won emergency ad hoc relief each year from 1998 through 2001. And the 2002 farm bill, which reversed some of the 1996 changes, makes government involvement in U.S. agriculture likely to continue into the foreseeable future. Economists frequently criticize this complex, wasteful, and durable web of policies. For example, subsidies for not growing crops are so notorious that they have been the object of biting political satire since their introduction in the 1930s. Other programs periodically make headlines, typically when treasury costs get large. Yet surprisingly, attempts to undertake comprehensive critical analyses of U.S. farm and food programs are rare. 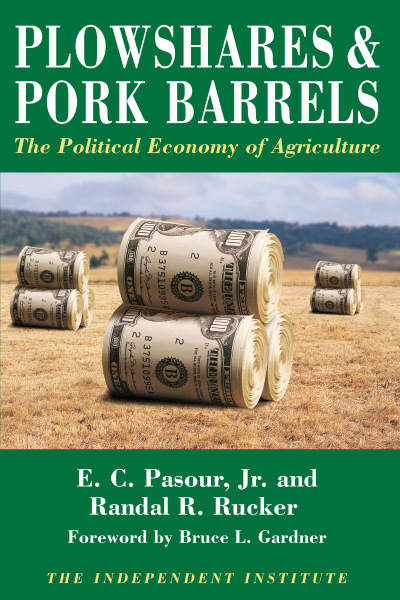 In Plowshares & Pork Barrels: The Political Economy of Agriculture, E. C. Pasour, Jr. and Randal R. Rucker lucidly scrutinize U.S. agricultural policy in its entirety. What makes Pasour and Ruckers approach particularly valuable, is not only the facts presented and analytical findings but even more the line of argument in which it is embedded, writes Bruce L. Gardner in the books foreword. The book consists of twenty chapters. Chapters 1 to 7 focus on the public-policy process, addressing questions such as: What is the role of economics and the economist in public-policy analysis? What is the origin of the network of programs affecting U.S. agriculture? Who gains and who loses from farm and food programs? Why have farm programs persisted long after the nation recovered from the ruinous conditions of the 1930s that precipitated the implementation of the programs? Plowshares & Pork Barrels compares and contrasts the market process with the political process. Chapters 4 and 5, which are devoted to public-choice theory, show how economic principles can be used to explain decision-making in the political process. There is, for example, an overspending bias in agricultural policy because of the separation of power and responsibility by elected and appointed public officials who formulate, administer, and evaluate farm programs. There is also a bias toward programs involving investments with near-term benefits and distant costs. Are farm programs driven more by the public interest, or by income redistribution? According to the public-interest argument, government intervention is justified because agricultural markets do not conform to the ideal of perfect competitionthat is, there is market failure. Pasour and Rucker stress, however, that the political process in agriculture has similar flaws and that real-world political institutions affecting agriculture fall short of the perfect political institutions implicit in some analyses. Consequently, Plowshares & Pork Barrels emphasizes a comparative institutions approach: agricultural (and other) markets in the real world are compared with the political process in the real world. Pasour and Rucker argue that agricultural programs are better explained as income-redistribution mechanisms than as tools for correcting market failures. Chapters 8 to 10 describe fundamental agricultural policy tools, as well as the operation and effects of numerous past and present farm programs. Here, Pasour and Rucker argue that the parity and cost-of-production approaches to setting the level of price supports are arbitrary and subjective. They also sift through the myriad complexities of programs for tobacco, peanuts, sugar, honey, and other products to illuminate the primary economic effects of those programs. The remainder of Plowshares & Pork Barrels describes various other farm and food programs and analyzes their economic effects. It examines marketing orders (ch. 11), commodity programs (ch. 12), food stamp and other subsidized food programs (ch. 13), trade protectionism (ch. 14), crop insurance (ch. 15), subsidized credit (ch. 16), conservation programs (ch. 17), research and education programs (ch. 18), and taxation (ch. 19). Chapter 20 summarizes the total impact of the network of farm programs. In doing so, it presents data showing how outlays in various categories have changed over time. The categories include direct payments and price supports, subsidized food programs, credit programs, conservation, and research and education. An appendix describes the ways in which the 2002 farm bill updated existing law. Not only have farm programs failed to achieve their stated objectives, but the programs themselves are frequently inconsistent. Some farm programs, such as price supports and food assistance programs, often serve to increase product prices. Others, including subsidized credit, conservation subsidies, subsidized crop insurance, and publicly financed research and educational activities, place downward pressure on product prices. Plowshares & Pork Barrels demonstrates that these policies benefit the few at the expense of the many. Applying the tools of public-choice economics, Pasour and Rucker attribute the persistence of huge expenditures on farm programs to the success of agricultural interests in using governmental power to transfer income from taxpayers and consumers to farmers, owners of land and other farm assets, government employees, and agribusiness firms. The greatest irony of all, however, may be that the object of so much popular sympathythe small, family farmerultimately receives a very small proportion of government payments to farmers. Rather, Pasour and Rucker demonstrate that the vast majority of the benefits from government programs and payments go as a form of corporate welfare to large farmers whose incomes already considerably exceed average incomes in the nonfarm sector. By detailing the effects of the federal governments century-long intervention in the farm sector, Plowshares & Pork Barrels fills in a scholarly gap that has been neglected for too long. Although there is a clear propensity for government agricultural programs to continue indefinitely, the elimination of the tobacco program in 2004 shows that fundamental changes in farm programs are possible. The searching critique presented in Plowshares & Pork Barrels provides a conceptual basis for reconsidering the efficacy of agricultural policies. E. C. Pasour, Jr., is a Research Fellow at the Independent Institute and Professor Emeritus of Agricultural and Resource Economics at North Carolina State University. He is the author of Agriculture and the State: Market Processes and Bureaucracy and has contributed to numerous books including Agriculture and Energy (W. Lockeretz, ed. ), and Economy, Society and Public Policy (C. Pope and L. Wimmer, eds.). Randal R. Rucker is a Research Fellow at the Independent Institute and Professor of Agricultural Economics and Economics at Montana State University. A contributor to numerous scholarly volumes, Professor Rucker is the author of many technical studies on natural resource and environmental issues.